When I think of my childhood, I think of growing up in the country. We lived on 10 acres of land in a small town in Mississippi, and I just remember spring being so bright and colorful and green. It was beautiful! This recipe takes me right back to being a kid. The bright herbs on this symbolize the bright green grass and the citrus zest makes me think of the bright colored wildflowers growing all over our yard. This chicken is extra juicy and oh so fresh! 1. Heat oven to 350. Mix the butter, garlic, and thyme together in a small bowl. Set aside. In a larger bowl, mix the lemon zest, orange zest, dill, chives, and parsley together. Set aside. 2. Pat the chicken breasts dry on all sides using paper towels. Without tearing the skin off of the chicken, using your fingers, lift the skin up from the chicken and rub 1 tbsp of the butter mixture under the skin of each breast and the tops of the skin. 3. Liberally salt and pepper both sides of the chicken breasts and place on a baking sheet, skin side up. 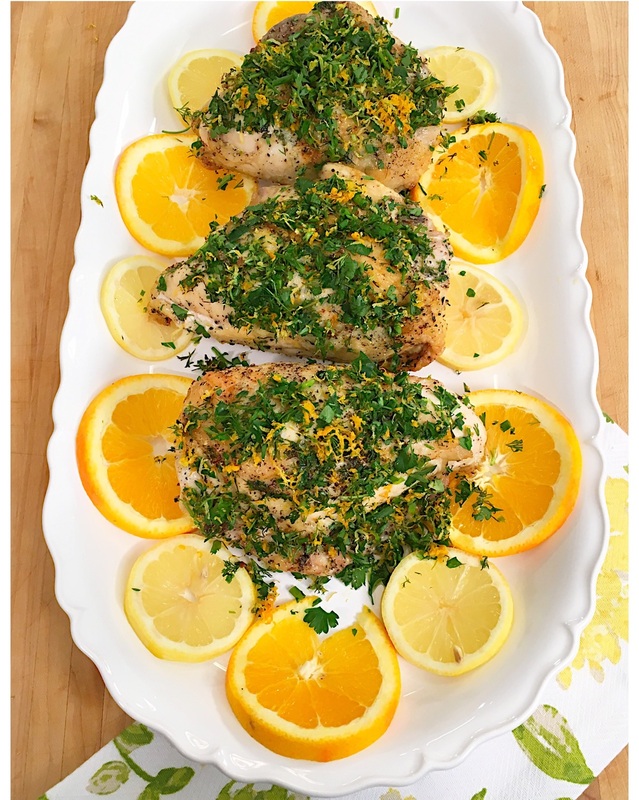 Lightly brush the skin on each chicken breast with olive oil and sprinkle about ¼ of the citrus-herb mixture over the top.. Bake for about 30-35 minutes until the thickest part of the breast reads 165 degrees. Turn your oven setting to broil, and broil the chicken for about 3-5 minutes until crispy. Plate and sprinkle with remaining citrus-herb mixture. Garnish with orange and lemon slices.